Project consortium and invited experts gathered in Barcelona in October 2018 for a meeting co-organised by ICO and ENSP. 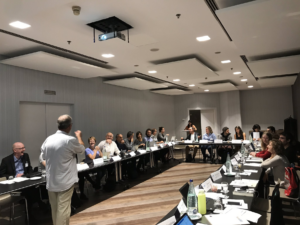 On 8 October project partners exchanged updates from their WPs and on the following 2 days interim workshop, with participation of the Advisory Board, the EC and an invited expert in the field of tobacco research, took place. Three members of the Project Advisory Board (Armando Peruga, Ana Navas-Acien and Dan Smyth) and the External Ethics Advisor (Fèlix Bosch) participated in the workshop. In addition to them, Kamran Siddiqi who is the coordinator of TB and Tobacco Horizon2020 project, professor in Global Public Health from the University of York, joined the meeting as an external expert. Moreover, Dr. Amalia Irina Vlad, Scientific Officer from the European Commission attended the interim workshop. The main objective of the interim workshop was to present intermediate project results to experts in order to receive their feedback before the final stage of the project, especially with numerous scientific publications being in the pipeline. Programme of the workshop was arranged around three main topics: survey, morbidity/mortality attributable to SHS & economic evaluation, measurements, and dissemination activities. Each WP presented a summary of the results achieved until October 2018, a list of planned publications and highlighted main challenges that were further discussed with experts.